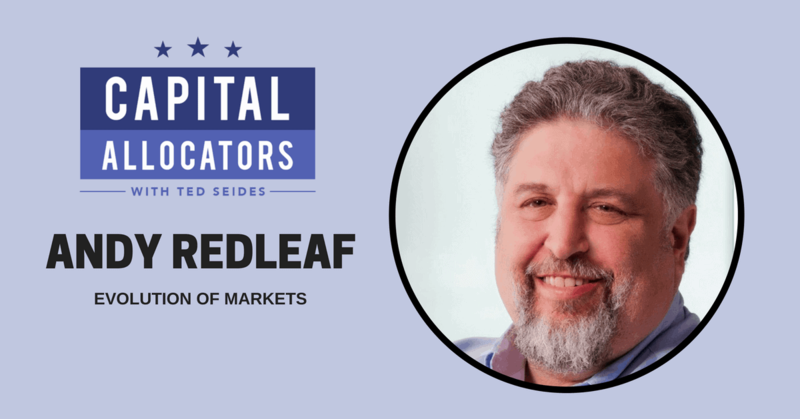 Andy Redleaf is the Founding Partner of Whitebox Advisors, a $5.5 billion multi-strategy hedge fund launched in 1999 with primary offices in the metropolitan hubs of Minneapolis, Austin, and Sydney, Australia. Before founding Whitebox, Andy spent twenty years trading options, for two years at Gruntal & Company alongside Stevie Cohen, fourteen on the CBOE, and five as a Founding Partner at Deephaven Capital Management. He has an irrepressibly creative mind and, alongside his partners, writes one of my favorite manager letters. Our conversation covers Andy’s nuanced view of the evolution of trading markets and financial instruments over his forty year career, including arbitrage trading in the 1970s and 80s, unintended consequences of the deregulation of trading commissions, segmentation of market participants, importance of liability management, growth of orphaned securities, and the pending shift from decentralized to centralized market systems over the coming years.